I know, I said earlier I was going to look at Detroit's minor league teams. That would mean the Vipers would be next, but I decided to cover them later when I had time (I have a TON of programs from that team). Instead, I'm going to look briefly at Muskegon. 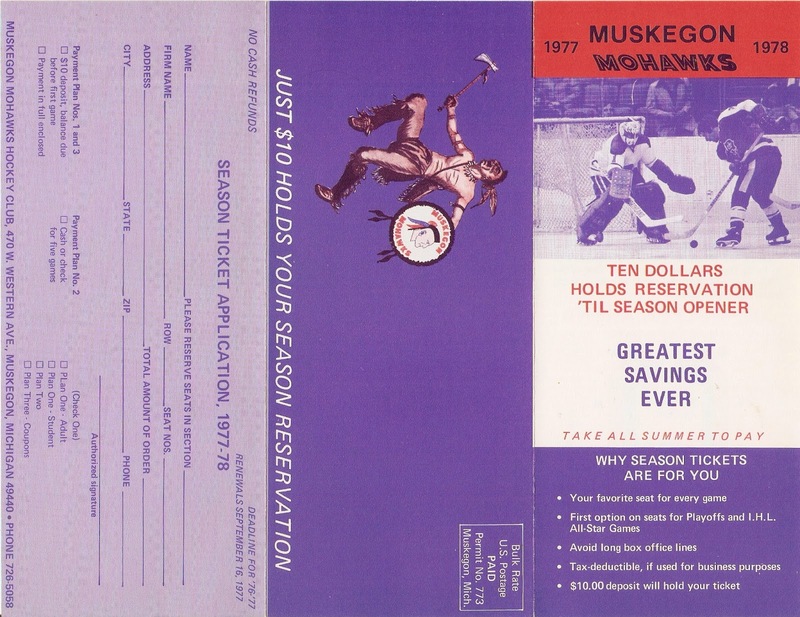 Muskegon has had a long, colorful past in professional hockey. It all started in 1960 with the expansion Muskegon Zephyrs of the IHL. Five seasons later, 1965-66, the Zephyrs became the Mohawks, and remain so until 1984-85, when they became the Lumberjacks. The Lumberjacks would remain in town through the 1992-93 season. After that season, the franchise would relocate to Cleveland, Ohio. Here are the Mohawks programs I have, along with a couple bonus scans. 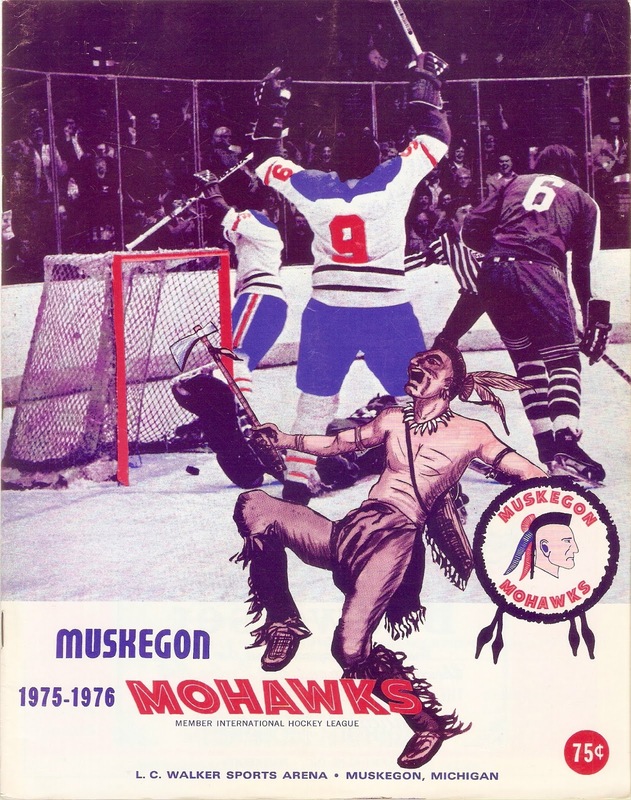 The Mohawks existed from 1965-84, about 20 seasons, and had two vastly different eras of success. From 1965-76, the Mohawks finished above .500 10 times, winning the Huber Trophy (Regular Season Championship) six times and the Turner Cup (Playoff Champs) in 1967-68. They also made the Finals one other season. However, from 1976-84, the Mohawks went into a hideous tailspin, on and off the ice. The team never again finished above .500 and never made it past the first round of the playoffs. The franchise hit rock bottom in 1978-79, as the Mohawks started the season with a horrific 3-32-3 record, on their way to a franchise-worst 15-58-7 mark. Things got so bad off the ice that the Mohawks were often in danger of being evicted from LC Walker Arena in the early 1980s due to unpaid rent and rising bills. 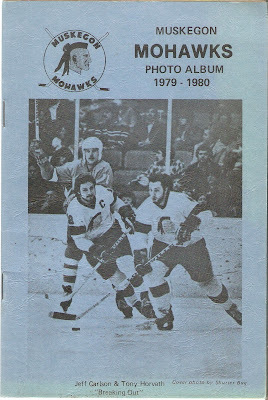 1971-72 was another great season for the Mohawks They "three-peated" as North Division champions, going 49-21-2 for an even 100 points, 22 points ahead of second place Port Huron.The team was coached by longtime minor league forward Moose Lallo, who finished his playing career in Muskegon with the Zephyrs. On offense, Muskegon was tops in the league, lighting the lamp 328 times. Bryan McLay, Gary Ford, Bob Smith, Don Liesemer and Darrel Knibbs each had over 30 goals. McLay led the team with 48 goals, while Ford topped the team in points (109). Defensively, the Mohawks were just as good, as they led the league in that department as well. Muskegon netminders allowed a league-low 231 goals. The team used three goaltenders, including Glenn "Chico" Resch. Resch would go on to play in the NHL with the New York Islanders, Colorado Rockies, New Jersey Devils and Philadelphia Flyers. Due to finishing first overall, Muskegon earned a first round bye in the playoffs. In Round Two, the Mohawks disposed of the Dayton Gems with relative ease, winning in 5 games and outscoring the Gems 24-16. In the Turner Cup Finals, however, Muskegon would be upended by the Port Huron Wings in six games. This would be the last Finals appearance for the franchise until 1984-85. Kind of a small program, dimensions-wise, but still has 58 pages loaded with ads and stats. This one is actually from a Turner Cup Playoff game (no idea which one). Love the "Mohawk Scalps" that point out the team's various championships. Don't think that would fly in today's world. 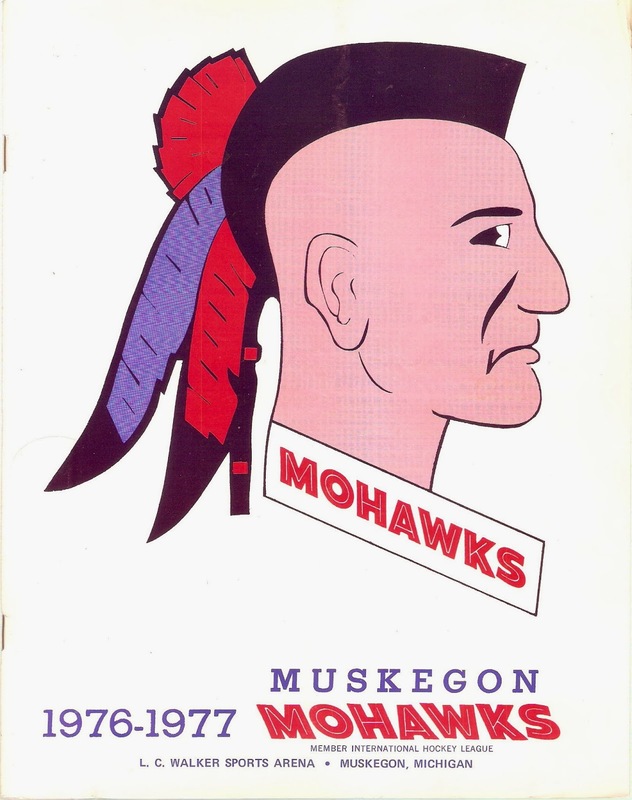 1975-76 was the final season the Mohawks would finish above .500. After finishing first overall the previous season, Muskegon would slump to fourth place in the North, going 34-31-13. Their 81 points would put them one point behind third place Flint, but 14 behind first place Saginaw. Moose Lallo was still behind the bench. For the third straight season, Muskegon was a farm team of the New York Islanders. 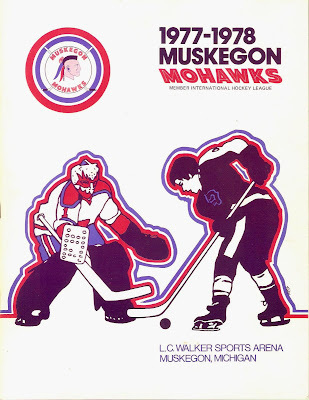 The lack of offense did the team in, as Muskegon scored only 260 goals, second worst in the IHL. Ernie Moser was the lone 30-goal scorer, as he led the team with 36 goals and 69 points. Murray Flegel also scored 69 points, on the strength of 59 assists. Defensively, the Mohawks led the league, allowing an IHL-low 238 goals. Don Cutts played 58 games, backed up by Steve Miskiewicz. A notable player on the Mohawk blueline was Bob Lorimer, who would go on to win two Stanley Cups with the Islanders. The Mohawks drew the Saginaw Gears in Round One of the Turner Cup Playoffs that season. The Gears made quick work of Muskegon, blowing them out in five games, outscoring the Mohawks 24-11 in the process. Dimensons-wise, this program is a lot bigger than the 1971-72 edition. It has only 46 pages, but still has your usual flood of ads, stats and articles. Nice design on the front. This is from a game against the Toledo Goaldiggers, defending Turner Cup Champions that year. The string of sub-.500 seasons would begin in 1976-77. Muskegon remained in fourth place in the North, finishing 31-36-11. The 73 points the Mohawks earned left them 18 short of regular season champ Saginaw. Bryan McLay and Moose Lallo coached this season (not sure who finished the year). The Islanders were back as NHL affiliates. Once again, the Mohawks were next-to-last in offense, scoring 294 goals in 78 games. Despite this, they did have a 50-goal scorer, as Garth McGuigan netted 54 to go along with 94 points. Yvon Vautour potted 43 goals along with 90 points. Unlike previous seasons, team defense wasn't a strong point. Muskegon allowed 322 goals, second worst in the league. Three goaltenders were used that season, including minor league veteran Ted Tucker, who played in 46 games. The Mohawks qualified for the postseason, and again drew the Saginaw Gears. This time, Muskegon made a series of it. According to SaginawGears.com, Muskegon jumped out to a 3-zip series lead before falling to the Gears in seven. What a heartbreaker! The Gears went on to win their first Turner Cup after surviving that scare. This program has about 54 pages, and yes, loaded with ads, articles and stats. The Vets Player Profile features goalie Ted Tucker. Also, the new "Voice of the Mohawks" was Dan Waxell, who would later call games for the Saginaw Wheels/Lumber-Gears franchise in the 1990s (poor guy). I like the nickname Muskegon Mohawks, but not sure if that logo would work in today's PC world. It's not ridiculous as Chief Wahoo and the nickname isn't viewed as a slur like "Redskins", but I doubt a team would be called Mohawks today. 1977-78 was when the team's fortunes started to really take a turn for the worse. The Mohawks slumped to last place in the North, going 27-42-11. Muskegon finished 27 points behind first place Saginaw and only one point ahead of league worst Dayton/Grand Rapids Owls. According to HockeyDB.com, Muskegon went through three coaches that season (Lallo, McLay, Gerry Moore). Teams with that record usually have trouble scoring goals and keeping 'em out, and the Mohawks were no different. The 1977-78 edition scored 290 goals, tied for second-worst in the league with the Owls. They did have some weapons on offense, including Charlie Skodjt (pronounced Scott, according to the program), who scored 45 goals and 98 points. Hector Marini and Neil Hawryliw also scored over 30 goals. Muskegon allowed 322 goals, fourth worst in the IHL. Rocky Menard and Andre LePage played the bulk of games in the Mohawk net. Despite the forgettable record, Muskegon did qualify for the playoffs again (only the Owls missed that year). This time, the Mohawks drew the Fort Wayne Komets, first overall in the league. Despite being heavy underdogs, the series went a closely-contested six games, with the Komets prevailing. This is the first Mohawks program I found for sale. I bought this years ago at Gibraltar Trade Center in Mount Clemens. While this does have rosters for the Mohawks and visiting Flint Generals, this wasn't purchased at a game. I can tell because it came in the envelope it was shipped in (complete with Mohawks mailing address. Inside, your usual 46 pages complete with ads, stats and articles. Typical program stuff. There's also an "Open Letter to Mohawk Fans" by Moose Lallo. The letter went over the changes the franchise was going through as well as imploring fans to continue supporting the franchise. I love the front of this program. It's based off an action shot of a Mohawks-Flags game. I scanned it earlier and am using it as my desktop wallpaper for my school computer. Very nice! This program also had a season ticket brochure in perfect condition! Here are scans of both sides of the brochure. 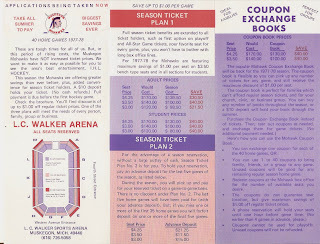 Apparently, Mohawks season tickets were the "GREATEST SAVINGS EVER". As you can tell, the program cover is based off the picture that's on the front of the brochure. After the horrific 1978-79 season, the Mohawks had nowhere to go but up (when you're coming off a 15-win season, can you seriously get any worse?). While Muskegon remained in the North cellar, they did improve to 29-43-8. They finished 33 points behind league-leading Kalamazoo. Gerry Moore returned behind the bench. While Moore had some success in the IHL in the early 1970s with Dayton, the Mohawks teams he coached were outclassed more often than not. 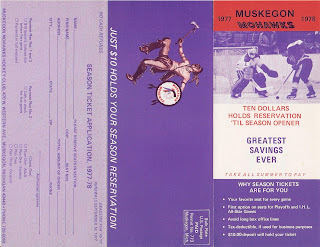 Goal-scoring shot up after '78-79, as Muskegon scored 317 goals. The Mohawks had a trio of 40-goal scorers, including team leader Kevin Reeves (42 goals, 106 points). Veteran Jim Johnston and Alex Belcourt were the other 40-goal scorers. Team defense saw the biggest improvement. In 1978-79, a porous Muskegon defense allowed a franchise-record 475 goals. In 1979-80, the team allowed 330, still fifth-worst in the IHL, but a huge improvement. The Mohawks used five goaltenders, including rookie Rick Knickle, who would forge a long career in the minors. Muskegon had two more wins than Grand Rapids, and therefore earned the final playoff berth. They faced rival Kalamazoo in Round One. The defending champ K-Wings made short work of Muskegon, outscoring the Mohawks 29-11 in a 4-1 series win. This is actually a photo album, not a program. I found this on eBay last year. It has a couple ads on the inside covers, but the rest are, of course, pictures of the coach and each player with printed autographs. The recession of the time really hit the Midwest hard, and Muskegon was no different. Paying customers were hard to find for most teams, especially for a bottom-feeder like the Mohawks had become. Financial problems would become so bad that the team came close to being evicted from LC Walker Arena and being kicked out of the IHL. Surprisingly, things would continue to deteriorate before it got better. 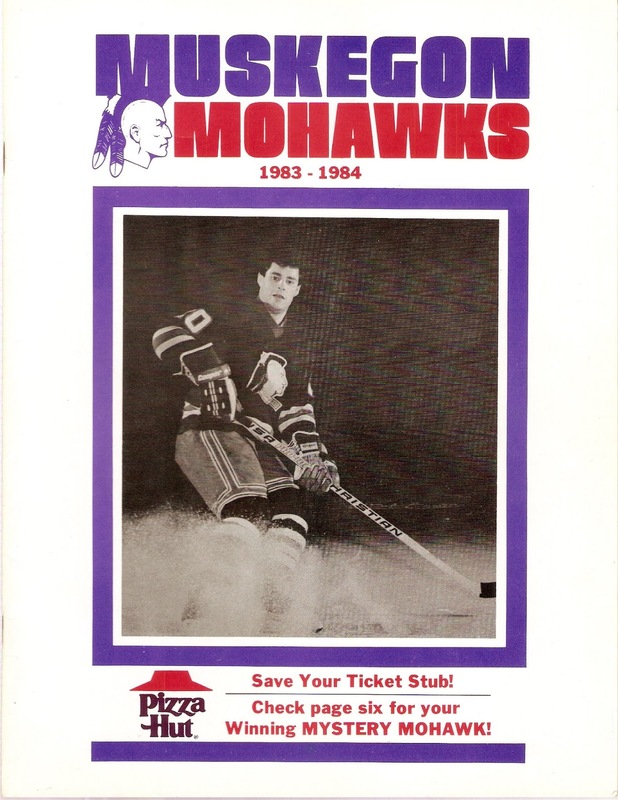 By 1983-84, the Mohawks were a bottom feeder on the ice and in serious financial trouble off it. The team bottomed out yet again this season, going 19-55-5, easily dead last in the league. Muskegon's anemic 46 points were a stunning 66 points behind league-leading Fort Wayne. Doug McKay was back behind the bench. 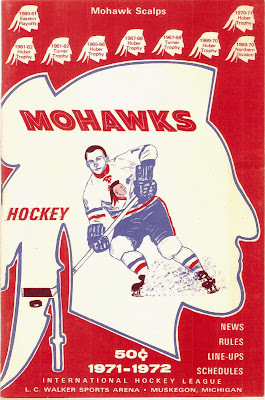 The program states that New Jersey, Toronto and Pittsburgh were the NHL affiliates "working to make the Mohawks a WINNER!!! ", but judging by the end result, they didn't work that hard. All three of those teams were pretty awful that season, and the Mohawks were no different. To the surprise of no one, Muskegon was dead last in both offense and defense this season. But despite scoring only 282 goals in 82 games, they did have some talent. Scott Gruhl, on his way to becoming the all-time leading scorer in the minors (since passed), had an outstanding season. Gruhl scored 40 goals and 56 points to lead the way for Muskegon. He was joined by midseason acquisition Mike Krensing, who scored 46 goals and 74 points with both Milwaukee and the Mohawks. On defense, the Mohawks were beyond terrible. They allowed a league-worst 435 goals, second-most in franchise history. Four goaltenders were abused by this porous defense, including veteran Bob Parent, who played in 35 games. 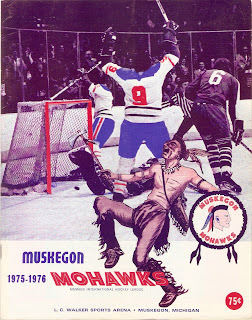 The Mohawks opponent for this game was the Flint Generals. Talk about two teams going in opposite directions. Muskegon was well on their way to another hellish season in front of few paying customers. The Generals, on the other hand, were starting to get on a serious roll that would take them all the way to the franchise's only Turner Cup title. Flint was left off of the stats sheet, for some reason. 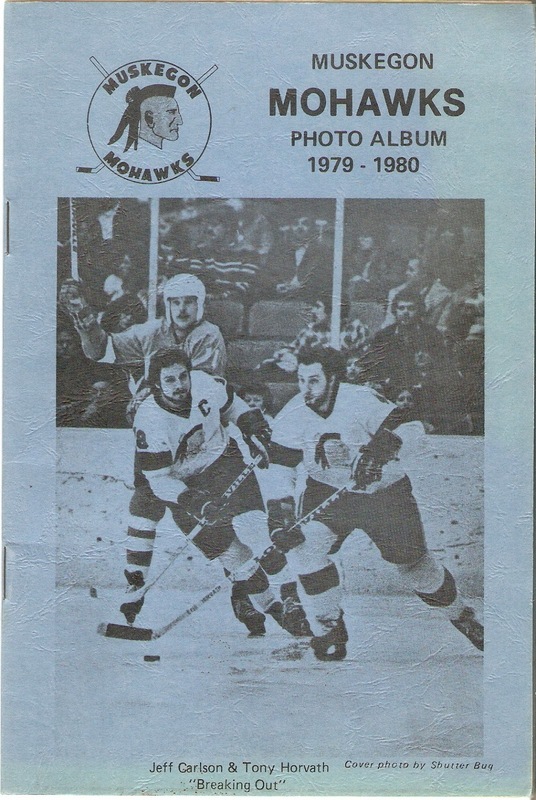 The guy on the front cover is Mohawks defenseman Jim Turner. Turner was in his second, and according to HockeyDB.com, final, pro hockey season. 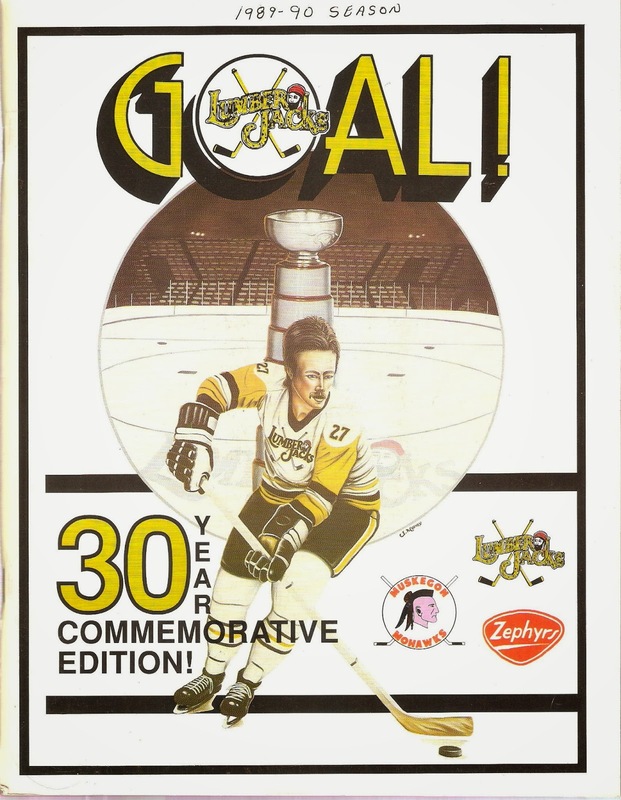 The "Cover Player Profile" notes that Jim's dad, Bob Turner, played in the NHL for eight seasons, winning five straight Stanley Cups with Montreal. Not too bad a run! This program is only 34 pages long, with the usual ads, stats, photos and articles. The Mileage Chart on page 34 shows that the IHL had shrunk to only seven teams (the Saginaw Gears folded the previous season) and one division, with Toledo and Muskegon on shaky ground. I end my look at my Mohawks with this ad on page 3. 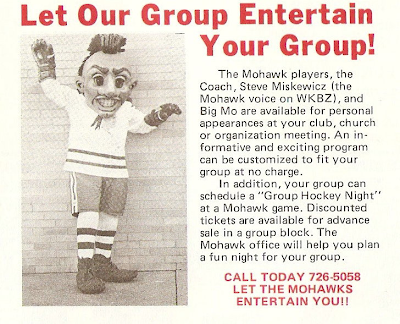 This disturbing-looking fellow is Big Mo, the Mohawks mascot. Can you imagine the uproar if a team debuted this guy at a sporting event? Seriously, he looks creepy as hell! The Mohawks were purchased by former Central Hockey League executive Larry Gordon for $1 after the 1983-84 season. He would rename the franchise "Muskegon Lumberjacks", a nod to the area's lumbering history. Team colors would change to black and gold, the same as their new primary affiliate, the Pittsburgh Penguins. Thanks the influx of talent from the Penguins, the Lumberjacks would immediately become an IHL powerhouse, going 50-29-3 in 1984-85 and making it to the Turner Cup Finals. They would win it all the following season, then win another in 1988-89. 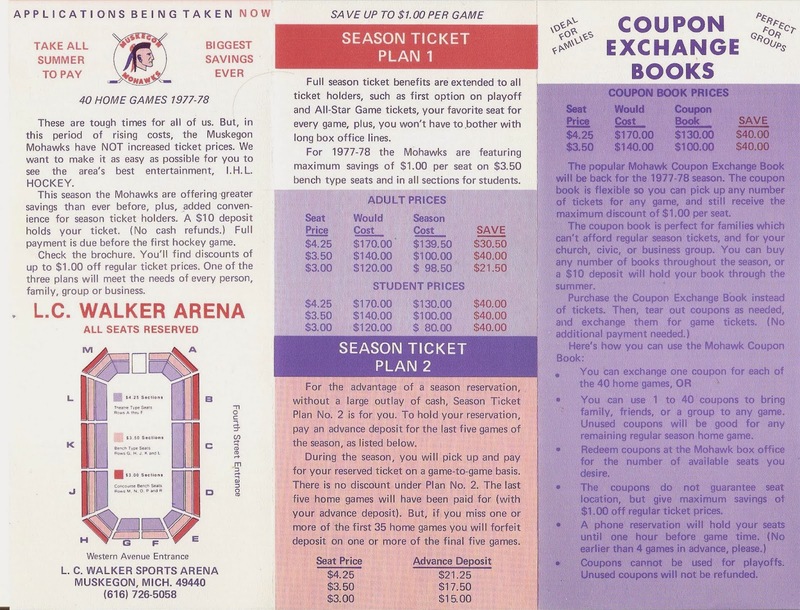 The Jacks remained a league power for the remainder of their time in Muskegon, but rising costs of IHL hockey and low attendance would force Gordon to relocate to Cleveland, Ohio, for the 1991-92 season. The Lumberjacks would be replaced by the Muskegon Fury of the Colonial Hockey League.